Place limas in a casserole. Cover with the sauce mixture. Bake in moderate oven (350°) 30 minutes. Makes four generous servings. The first time I soaked a pound of lima beans overnight, we had something come up the next night and I didn’t have time to cook them for three hours. So I left them to soak another night. After 48 hours, something had gone wrong: my kitchen smelled like a moonshiner had set up shop and they were frothing like mad. Apparently beans start to ferment pretty quickly! Even repeated rinsing couldn’t get rid of the beery smell, so I threw them in the compost bin to start again. A few days later, the soaking went fine, but when I tried to cook them, I didn’t add enough water and it all boiled off and the beans on the bottom of the pot burned. More beans for the compost pile. After a week, I finally, finally managed to get the beans soaked, cooked, non-alcoholic, and non-burnt. So we were ready to actually make the rest of this casserole thing. This is “bean water,” which is what’s left after boiling beans for a few hours. It’s starchy and tastes like beans, and apparently it’s important to keep some for the casserole. I sautéed the sausage with the onions quickly. Adding the tomato sauce and bean water began to dangerously overload my skillet, but with gentle stirring it all stayed intact. Everything got poured over the beans and it baked for a half hour. This was quite good. Upon reflection, once I stopped being obsessed with the stupid bean problems, I realized this is essentially a meaty spaghetti sauce over beans instead of pasta. The kids loved it, the adults loved it, and the additional nutrition from beans makes this a pretty good idea for a meal. It can probably even be made in under 24 hours by using canned beans! My question is simple, do the dried limas taste different than canned or frozen? 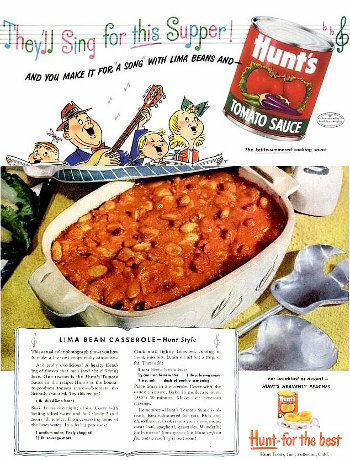 As a kid, I ate lima beans with ANY Italian food in school cafeterias. I just don’t get the lima bean / tomato sauce(d) foods! Just trying to understand the system…and dried lima bean flavor. Oh, HAH! I feel you on the beans. I learned that lesson the hard way – you cannot fix the whole soaked-until-fermented thing. Cooking them makes them smell even worse… This is kind of lima beans in a baked beans sauce, sort of. We rinsed the beans several times, until they didn’t really smell much. At that point, we thought we might be able to go forward. However, as soon as we put them in water again, they started to smell more, so that was out. There is a small gray box that says “+ Follow” down in the lower right-hand corner — if you click on that, I believe it pulls up a box that will let you subscribe to get an email every time I post. This is pretty much pasta fagioli minus the pasta. – you could probably do this with canned beans and a good spaghetti sauce. Add a salad and it would be a nice meal.